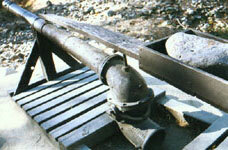 Hydraulicking Cannon, Coloma. Photo: Pratap Chatterjee, 1997. "You: who have priced us, you who have removed us: at what cost? What price the pits where our bones share a single bit of memory, how one century turns our dead into specimens, our history into dust, our survivors into clowns?" Dedicated to the memory of the peoples who have died and the peoples that are being slowly killed today: from the Amungme of New Guinea, the Macuxi of the Amazon to the Western Shoshone of the western deserts of the North American continent. Gold! The word spread through the sleepy hamlet of Yerba Buena, perched on the sandy slopes of the sheltered bay, like wild fire. It was 1848. A battle-weary Mexico was preparing to hand over its northern territories to the United States. Nine days before the two countries were to sign their peace treaty, word arrived that James Marshall had discovered the yellow metal. James Polk, outgoing United States president, proclaimed the wealth in the west, holding up 14 pounds of gold from the new state in congress. The following year the famous Gold Rush of '49 began, swelling the white population of the state from 13,000 to 300,000 by 1854. The settlers arrived to discover that California had a rich and diverse native population. Many of the coastal communities had been forced into the missions by the Spanish and the Mexicans. The argonauts, as the gold prospectors were known, went beyond the coastal missions into the Sierras, down to the brush covered hills and marshes of the Sacramento and San Joaquin valleys, and climbed the mountains of the rugged northwest. Most settlers were poor, lured west by promises of quick riches and bountiful land with a mild climate. They were not evil men and very few of them survived the life in the mining camps, let alone became rich. But they brought new unknown diseases and an abiding fear of the Native Americans. White volunteer militia led battles over the land financed by the state governments who were eager to encourage settlement in the west. New hydraulic technologies helped blast the river backs and mountainsides apart, dumping billions of tons of sediment waste into local rivers. Deadly mercury, much which was inadvertently lost in the rivers, was used to extract the gold. Some of the mercury is now trickling into towns of northern California. The story of the Gold Rush in California may be 150 years old but gold fever continues around the world today. Poor landless peasants from Brazil to the Philippines are invading the tropical forests, decimating indigenous communities with diseases and poisonous mercury. The hydraulic technology that blasted apart California's hills may be gone but Bay Area companies like Bechtel of San Francisco still provide the equipment for companies like Freeport McMoRan to tear apart the mountains of New Guinea. And in recent years, another new technology - the use of cyanide to extract gold - has sparked a new Gold Rush by multinational corporations such as Homestake of California which is digging up the traditional lands of the Pomo in Clear Lake three hours north of San Francisco. Yet over four-fifths of the gold that is sold around the world today is turned into jewelry. This jewelry serves no useful purpose, it simply lines the pockets of executives and shareholders of companies like Freeport, Homestake and Newmont. Now, a century and a half Yerba Buena was transformed, on January 24th, 1998, the California Sesquicentennial Committee kicks off three years of celebrations to romanticize the Gold Rush. This report is the untold story of the environmental and social tragedy that accompanied the birth of the state of California. Today, the descendents of the tribes that survived the holocaust of the Gold Rush live on toxic lands.